Here’s a picture of the birthday cake that, along with a lot of other things, surprised me last weekend. The side you don’t see had pine trees around the bottom. Looked good and tasted delicious. 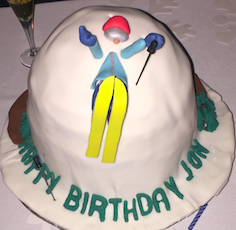 If you have a ski-related cake or other confection you’d like to share with the SeniorsSkiing.com community, send a picture to [email protected] or [email protected].